The Sienna is designed for artists working in all mediums who love the pointing, color holding, spring, sharp edge, and smooth application of a superior blend of filaments, but equally demand durability and value associated with synthetic brushes. The handles are made of kiln-dried birch wood, forested in Maine, and multi-coated in high gloss lacquer to create an attractive and long-lasting finish. 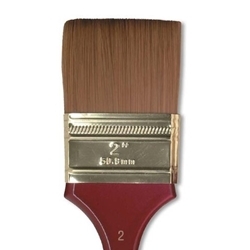 The brush itself is composed of high quality, state of the art, synthetic filaments resulting in a rich mixture with a smooth, soft feel which returns to a point or sharp edge every time. This luxurious blend allows for control in painting but with enough resilience to perform perfectly every time.